weaving and characteristics: galvanizing after weaving, galvanizing before weaving. 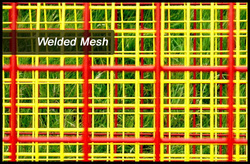 Welded wire mesh offers excellent corrosion resistance, flat surface and strong structure. application: used widely in industry, agriculture, building, transportation, mine field, lawn, cultivation, guard, decoration ,machine protection, etc. Arihant Steel is one of the largest manufacturers and delears of Wire and Wire products,perforated & expanded metal in all alloy. The Company has a 25 years experience in the industry and in recent years has organised and updated its manufacturing capacity to include the most modern methods and equipment across the entire range. We will like to introduce ourselves as a leading manufacturer of aluminium, G.I, Perforated sheets, Hexagonal wire mesh, Chainlink fencing, Barbed wire and all other wire products. Please feel free to contact us.